FILE - Merle Haggard smiles during a news conference at the Smithsonian's National Museum of American History in Washington, where he and his sister donated belongings taken on their family's Dust Bowl-era move to California on Route 66, May 28, 2003. Merle Haggard, one of the most recognizable voices in American Country music, died Wednesday — his 79th birthday — at his home in Palo Cedro, California, following a months-long bout with double pneumonia. honky-tonkers. He also broadened the genre by writing about poverty, loneliness and social issues. 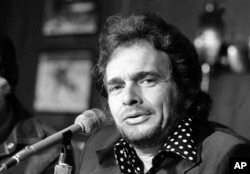 FILE - Country singer Merle Haggard is shown at a news conference in New York City, April 6, 1974. 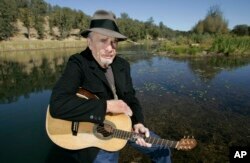 Haggard's sound drew from traditional Country but also touched on folk, pop, blues and rock. He referred to the improvisations of his band, the Strangers, as "Country jazz,'' and in 1980 he became the first Country artist to appear on the cover of the jazz magazine Downbeat. transcends his rich American musical heritage." He was born in 1937, the son of two Okies — Dust Bowl refugees from Oklahoma who moved west to escape the Great Depression and settled in Bakersfield. Haggard and his parents lived in an old railroad boxcar that his father, James Haggard, a railway worker, converted into their home. FILE - Merle Haggard performs at the 2015 Big Barrel Country Music Festival in Dover, Del., June 28, 2015. Haggard, who was nine years old when his father died of a brain tumor, quit school in the eighth grade and began hopping freight trains. He also took up the guitar and petty crime and frequently was placed in — and escaped from — juvenile reformatories. Later convicted of burglary — he had tried to break into a cafe but was too drunk to realize that at the time it was still open and serving customers — he served more than two years at the maximum-security state prison in San Quentin, near San Francisco, where he attended a concert for convicts by Johnny Cash, another legend in the world of American Country music, in 1958. Haggard decided to turn his life around and try to build a career in music. (He was pardoned years later by California's governor at the time and a future U.S. president, Ronald Reagan.) He returned to his hometown in 1960 and, along with Buck Owens, helped define what became known as the "Bakersfield sound" — a more raw Country sound than the highly produced music that was coming out of Nashville at the time. The subject matter of the songs Haggard wrote was more blunt than some of his fans were accustomed to — "Irma Jackson" was about interracial romance — and he rebelled when record company executives wanted to change his style. 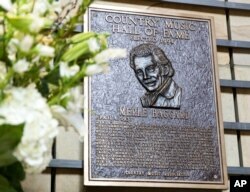 Flowers memorialize the death of Merle Haggard near his plaque in the Country Music Hall of Fame in Nashville, Tenn., April 6, 2016. Haggard toured constantly with his band and once described his life as "a 35-year bus ride" — and that was in 1996, long before his bus stopped rolling. Stardom took a toll on the man known to his fans as "The Hag," and his career waned in the late 1980s amid personal problems. He filed for bankruptcy protection in 1992 after years of hard living, four divorces, gambling and bad investments. He once estimated that he had blown $100 million. Country singer Carrie Underwood tweeted, "Merle was a pioneer...a true entertainer...a legend," while rock pioneer Jerry Lee Lewis said, "I will miss one of my best friends over all these years." 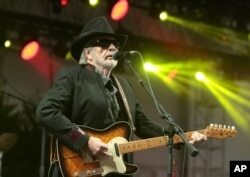 Longtime friend and frequent collaborator Willie Nelson told Entertainment Weekly, "He was my brother, my friend. I will miss him." FILE - Merle Haggard poses at his ranch at Palo Cedro, Calif., Oct. 2, 2007.